Eat your heart out Venice Biennale, we rural Aussie arts makers have an Australian Pavilion here in Wirksworth, England, too. Ours is in the Derbyshire Ecocentre, a solar powered architectural masterpiece built from local gritstone, limestone and European Larch, with a living roof of locally endemic native plants. Locals are very proud of this building, the first in Derbyshire to meet the highest design and performance ratings of Britain’s Building Research Establishment Environmental Assessment Method (BREEM). For the duration of the the 2013 Wirksworth Arts Festival the Ecocentre/Australian Pavilion will be exhibiting works by eight visual artists from Central Western New South Wales, all of them very present in Wirksworth as Festival guests: Ken Hutchinson, Christine McMillan, Harrie Fasher, Ngari Reynolds, Lanny Mackenzie, Christine Sweeny, Alesha Lonsdale and Tony Lonsdale (Guubbay). But it is not only Australian visual artists who are making their presence felt in Wirksworth. Scattered around the town are posters advertising an Australian Theatre Double Bill in the Town Hall, a contemporary dance-theatre work, Right Behind You, by Alison Plavey and Adam Deusien of the Bathurst-based company Lingua Franca, and Kim Deacon’s one woman show, Home Sweet Home: Henry Lawson and His Loves. These productions by very accomplished performers are extraordinary. 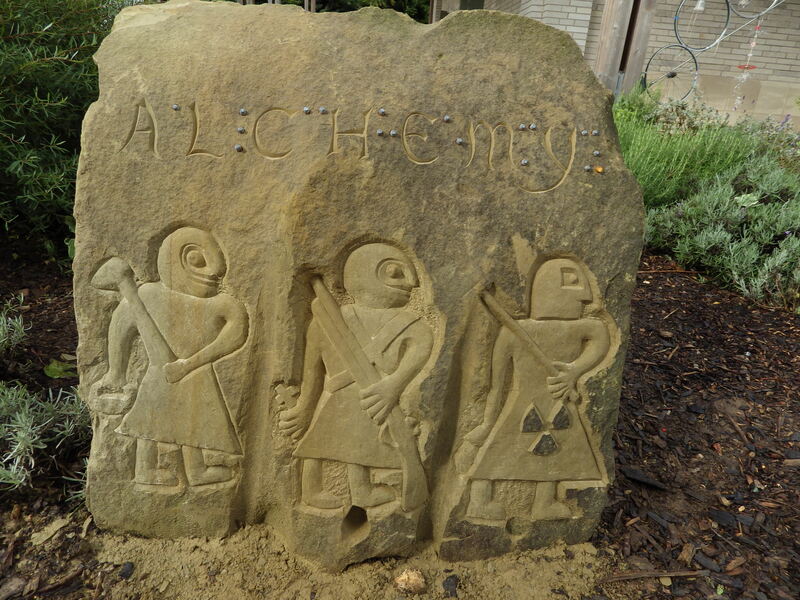 Even before visitors enter our Australian Pavilion up at the Ecocentre, they’re greeted by a now-permanent stone feature, the Alchemy Stone, carved by Ken Hutchinson and English stone mason Richard Hickton during their month long collaboration. We’ve adopted the concept of alchemy as the theme for our collaborative exchange, an idea which emerged from discussions with some of our English collaborators after we realised that, like many of our own communities in Central Western NSW, Wirksworth owed its existence to the mining industry. In Wirksworth miners dug for lead: in our part of the world it was gold. For centuries alchemists tried to transmute lead into gold, and, like those ancient experimenters, we creatives also seek to transform base materials into something more precious. Alchemy thus seemed a very apt theme for the transmutations we were now participating in. Ken Hutchinson and Richard Hickton’s Alchemy Stone commemorates this experience. Ken and Richard appropriated an iconic local image if a lead miner, the T’owd Man, as their project’s motif, This image dates from Saxon times and was found on a slab of stone in the village of Bonsall. It is now cemented into one of the walls of Wirksworth’s Church of St Mary the Virgin. This perky little chap is dressed in a Saxon tunic, and carries a lead basket in one hand and a pick in the other. Ken has replicated him in triplicate on the Alchemy Stone. In the first iteration T’owd Man wears his familiar Saxon tunic and lugs his pick and lead basket just as he does on St Mary’s wall. In the second, he is dressed as a British Redcoat and has swapped his basket for a cross and his pick for a lead-firing musket, the instrument the Empire used to procure colonial gold. (To add an extra edginess to this visual retelling of the T’owd Man story, Ken and Richard have translated the word Alchemy into Braille on the Stone using 45-calibre lead bullets!) In the third image, T’owd Man is wearing what might be a protective helmet, and his tunic is marked with a nuclear symbol. Instead of a musket he is carrying what could be either a fuel rod made from Australian uranium or a magic nuclear wand. Ken links this nuclear T’owd Man to the British nuclear weapons tests in Australia in the 1950s in his artist’s statement, and accuses the Brits of leaving parts of Australia uninhabitable and displacing hundreds of indigenous desert people. The Alchemy Stone by Cowra sculptor Ken Hutchinson and English mason Richard Hickton featuring the re-interpreted T’owd Man. But peeping over the top of the Alchemy Stone is an even older British icon: the foliated head of the mythic Green Man who also gazes from the heights of many medieval cathedrals. Stone carvers like Richard Hickton have been carving his head in sacred places on this island since pagan times. Are the sculptors suggesting that this enigmatic Green Man is judging us, as he peeks over the Alchemy Stone, or that his spirit will help us reverse the damage from our pasts, perhaps? Lanny Mackenzie’s celebratory Mancing Ide, or Fishing for Ideas, in the front gallery of the Australian Pavilion. Ngaree Reynold’s acrylics are in the background. Gamilaraay descendant Ngari (Nyree) Reynold’s works in acrylic, natural ochre and sand represent Aboriginal children, all of them faceless and semi-transparent against brightly coloured landscapes. One painting entitled Children Are Coming Home, for example, foregrounds four transparent and faceless little girls with dark curly hair, wearing identical white dresses. Dozens more similarly transparent and faceless little girls in the same white dresses follow them in a long conga line stretching off to the horizon. A barren orange and yellow landscape burns right through them. The artist’s statement accompanying this image is as stark as this painting’s background: The children of the Stolen Generations of Aboriginal children are coming home after the Australian government Apology on February 13th, 2008. The apology was a long time coming. Four of Wiradjuri descendant Tirikee Alesha Lonsdale’s acrylic paintings hang over the folding doors between the inner and outer galleries of the Australian Pavilion. Each are colourful interpretations of traditional Aboriginal themes painted, it seems to me, for a generation of young people still seeking comforting affirmations of their indigenous identities. Guubbay Tony Lonsdale’s seductively coloured semi-abstract encaustic wax works are similarly bright and non-confrontational. One image of elongated black ancestral figures against a swirling blue background is especially engaging. Five artists’s work is on show in the back gallery of the Pavilion: Christine McMillan, Harrie Fasher, Christine Sweeney, Guubbay Tony Lonsdale and Lanny Mackenzie. Christine McMillan, a very experienced older artist, is showing two conceptually sophisticated works, Response and Dry Stone Wall Studies, and, in a secluded nook outside, a third work, Grass Seeds, a projected animation of long tailed grass seeds moving like sperm across white gauze. Response, a mixed media work, features clay objects, altered lino prints and drawings, although the drawings have been omitted from this exhibition because of lack of space. This work is a visceral and visual investigation of the properties of clay as a material. Christine dropped cubes of wet clay onto a bench, turned them, dropped them, turned them, dropped them and repeated the process in a very controlled way again and again, possibly up to forty times, until the clay was stretched almost beyond its capacity to stand by itself. The outcomes of this violent process are a series of delicate boat shaped objects quite unlike the initial lump of material they emerged from. Four visually strong black and white framed lino print images, each of them cut up and reassembled, explore and interpret this process further. Christine McMillan’s second work, Dry Stone Wall Studies, is a response to the hundreds of miles of stone walling around Wirksworth. As with the clay project, she focussed on materials, the countless stones in their diversely myriad forms from which the walls are constructed. Her fine charcoal line work traces individual stones, or the gaps between the stones, or the routes of the walls follow. These abstracted charcoal drawings are presented as a series of postcards. Gallery visitors are invited to take some of the cards, alter them in some way, photograph them with their smart phones or tablets, then email them back to Christine to post on her project web site at [URL]. Derbyshire’s former poet laureate, River Wolton, took a bundle of the postcards for one of her creative writing classes and has now returned them to Christine by email. The results will soon be appear on the web site. Christine Sweeney’s photographic prints, Harrie Fasher’s bronze black cockatoo skulls and several of Guubbay Tony Lonsdale’s encaustic wax works in the back gallery of the Australian Pavilion. Sculptor Harrie Fasher’s two metal works, Black Cockatoo, a cast bronze piece, and her cast bronze and steel work Dry Argument, sit on two tall plinths in the centre of this gallery. Despite their small size they have a very strong, even haunting presence. Black Cockatoo is a cast skull of a species which is relatively rare around Oberon where Harrie lives. Her Dry Argument includes another cast cockatoo skull, this one chained to a pedestal constructed from found steel objects. The name Dry Argument is a reference to the long drought during which birds and other native wildlife, livestock too, suffered extreme thirst and hunger in the Central West. 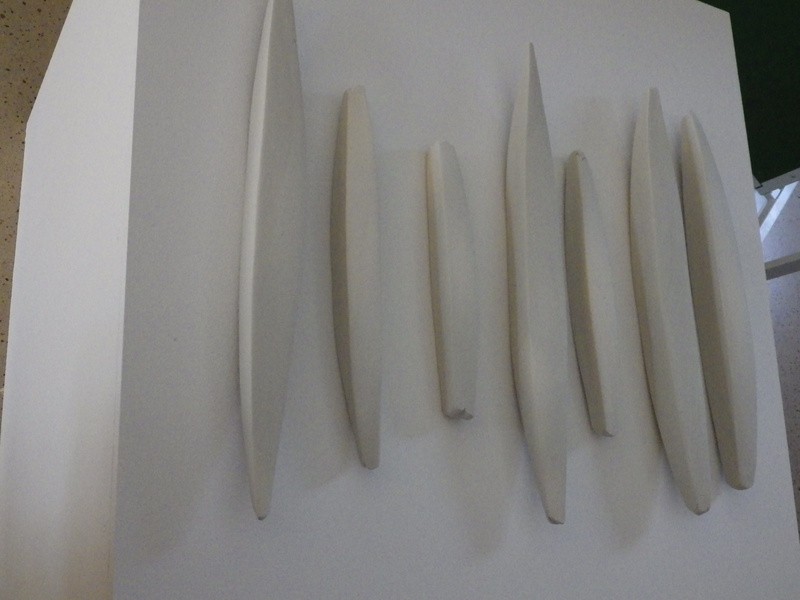 Bronze is a relatively new medium for Harrie, so we can expect many more such works from her in the future. She also brought two of her welded steel horses to the Wirksworth Festival. They were exhibited in the Saddler’s Cottage during the Art & Architecture Trail weekend. The back gallery of the Australian Pavilion is visually dominated not by either Christine McMillan’s works or by Harrie Fasher’s delicate sculptures however, but by an ensemble of giant photographic prints (1189 mm x 841mm) from a community music video project by Christine Sweeney, and a similarly large photographic print of Lanny Mackenzie’s dragon, a recent work called Ju Hong – Henny. 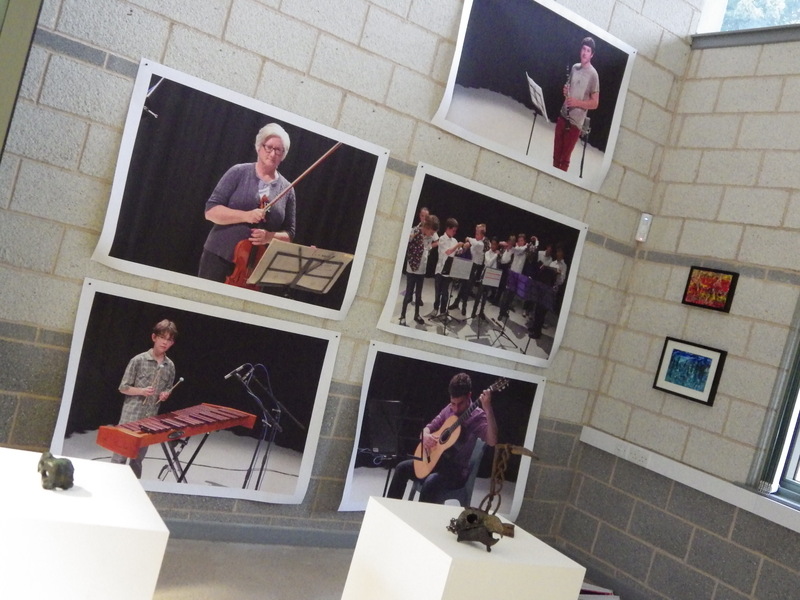 Christine Sweeney’s images show musicians and choristers associated with Mitchell Conservatorium of Music, which serves much of Central Western New South Wales. She has lit her subjects beautifully so they glow from the Pavilion wall. Her Mitchell Young Voices Choir, for example, is a captivating shot showing nine glowing children struggling into spotted vests behind their music stands just before a performance. In Fiona –Viola, another still from Christine Sweeney’s video production, the conservatorium’s director, Fiona Thompson, clutches her viola and bow and stares at us with a furrowed brow. In another image a much younger musician, a little boy with glasses, similarly gazes at us from behind his instrument in a print labelled Callum – Xylophone. Henny the dragon who was left behind in Australia because the airline company wouldn’t let her board! Woven work by fibre artist Lanny Mackenzie, design by Katie Mackenzie. 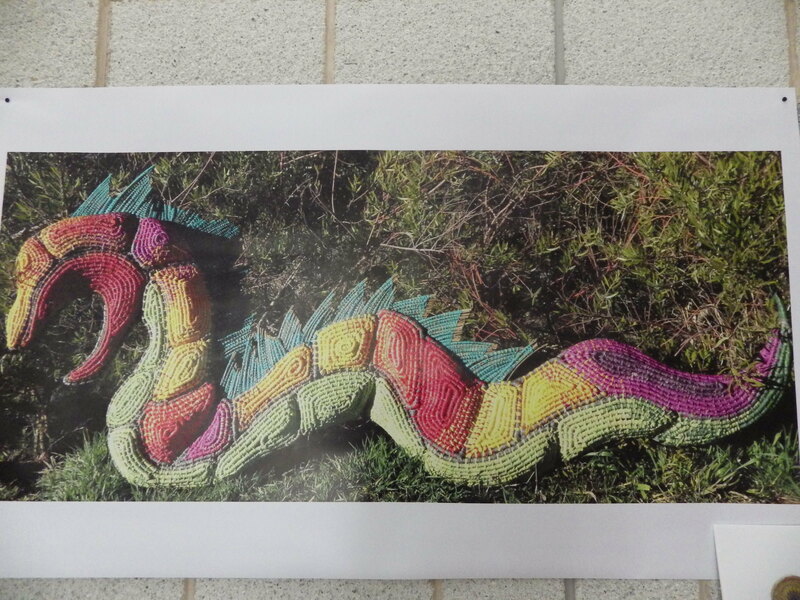 An image of Ju Hong Henny, Lanny Mackenzie’s dragon, sprawls across another wall. Henny was designed by Lanny’s daughter Katie Mackenzie and is named after Lanny’s sister who was born in the Year of the Dragon. In Chinese astrology the dragon “symbolises new beginnings, bright futures, youthful energies,” Lanny writes in her artist’s statement. The fresh non-traditional colours she and Katie have chosen for the family dragon reflect these values. Henny is constructed from a wire frame, willow branches, recycled shopping bags wrapped with dyed raffia, and glass beads. Unfortunately the actual dragon had to be left in Australia because the airline would not carry it as personal luggage … even though sports people can book through their equally large surfboards and golf clubs as luggage! This was a great disappointment and, from our perspectives, very discriminatory. The airline company is likely to hear more about Henny the Dragon when we return to Australia! Some of Lanny Mackenzie’s other works made from naturally dyed raffia, gumnuts, quangdong seeds, glass beads, New Zealand flax leaves, sedge grass and other fibres over recycled plastic shopping bag cores hang from the Pavilion’s ceiling. The stretched clay objects from Christine Macmillan’s Response at the Australian Pavilion exhibition. The Australian crew has been engaging with the Derbyshire community in workshops and in other ways during our sojourn in Wirksworth. We’ve left many traces of our visit. Most of us have presented workshops with community groups and worked collaboratively with local practitioners. Christine McMillan, for example, conducted belly casting workshops with teenage mums-to-be, and Ngari Reynolds has visited schools and preschools teaching children about indigenous Australian arts. We’ll look at some of these workshops in future posts, and at some of the opportunities for future collaborations that are now arising from our visit. See Alastair Clark’s blog post (at Don’t Get Lost: Promoting Sustainable Enjoyment of the Outdoors) on the very first Australian-UK artists outing, that walk on Cromford Moor. Tracey Callihan, one of the organisers of our cultural exchange, back in our ‘Australian Embassy’ in Coldwell Street, Wirksworth. Ken Hutchinson and Richard Hickton working on their Alchemy Stone. Richard Hickton’s Green Man peeping over the Alchemy Stone in front of the Derbyshire Ecocentre. Ken Hutchinson and Richard Hickton working on the Alchemy Stone at Derbyshire Ecocentre. The Alchemy Stone at the entrance to the Derbyshire Ecocentre, a permanent postcolonial reinterpreteation of Wirksworth’s T’owd Man story. Ken Hutchinson’s T’owd Men bas reliefs on sandstone, with some of his developmental drawings behind them in the Australian Pavilion. Meeting our UK collaborators at the Derbyshire Ecocentre. Alastair Clark conducts a workshop on sense of place with we Australians. Alastair leads our workshops out of the Ecocentre into nearby woodlands and up the track to Black Rocks. Our English collaborators at the Ecocentre to plan their responses to our Australian invasion. Photo by Chris Webb. Tracey Calliinan, an accomplished accordianist, performing at the opening party in the Australian Pavilion. Photo by Chris Webb. Joint MCs at the Australian Pavilion opening party. Local writer Matt Black held us spellbound at the edge of a cliff as he read his own work. Decorating the Australian Pavilion’s central feature, the open ended “fish trap” Mancing Ide. The Australian Pavilion sales table. Works by indigenous artists Ngari Reynolds and Guubbay Tony Lonsdale, with woven baskets by Lanny Mackenzie. Painting the plinths for the Pavilion exhibitors. Gallery curator Christine Macmillan and sculptor Harrie Fasher lug a plinth into place in the Pavilion. Christine Macmillan and Harrie Fasher with Christine’s installation, Response. Christine Macmillan’s altered lino prints from her installation, Response, awaiting hanging. Postcards from Christine Macmillan’s Dry Stone Wall Studies. Tirikee Alesha Lonsdale’s works in the Pavilion. We escape Wirksworth for a visit to Chatsworth House, the seat of the dukes of Devonshire. Photo by Chris Webb. Bathurst-based dancer Alison Plavey performs before one the Sotheby sculptures at Chatsworth House gardens. Ngaree Reynolds conducting a playtime workshop at the Wirksworth Memorial Hall. The stencils Ngaree brought with her for her workshops with children in Derbyshire. Belly castings made by young mums-to-be in one of the workshops conducted by Christine Macmillan. Kim Deacon performing her one woman show, Home Sweet Home: Henry Lawson and His Loves, as part of the Australian Theatre Double Bill in Wirksworth Town Hall. Photo by Chris Webb. Alison Plavey and Adam Deusien perform their contemporary dance-theatre work, Right Behind You, as part of the Australian Theatre Double Bill. Photo by Chris Webb. Our ‘Australian Embassy’, one half of the 300 year old former White Lion Inn in Coldwell Street, Wirksworth. 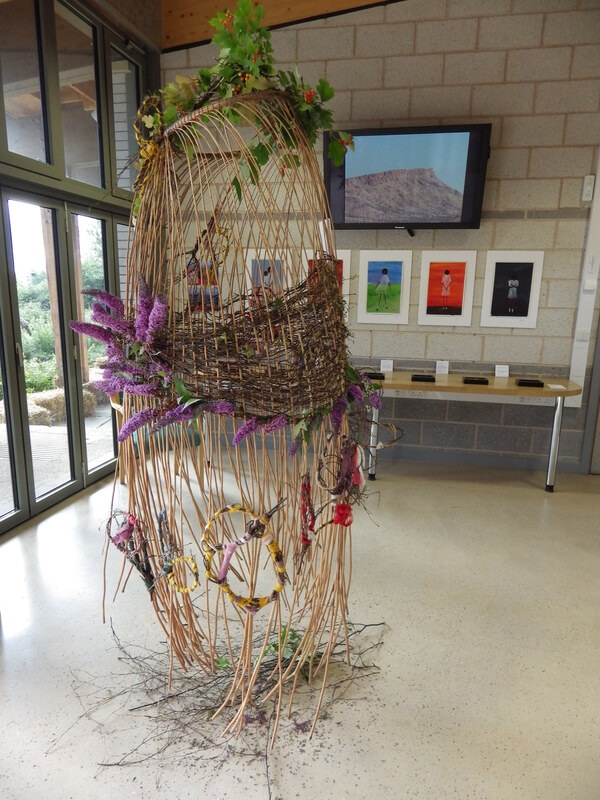 This entry was posted in community arts development, Derbyshire, Midlands, rural arts festivals, Wirksworth and tagged Alchemy Stone, Arts OutWest, Australia, Australian Pavilion, Derbyshire, Ken Hutchinson, Mary, Ngari Reynold, Venice Biennale, Wirksworth. Bookmark the permalink. So well captured Merrill, thank you.